Two Bears Farm and the Three Cubs: How Do Dinosaurs Talk? I'm so happy the twins are into dinosaurs right now. Pierce entirely skipped the dinosaur phase, much to my disappointment. I made the twins matching dinosaur pouches to carry their plastic dinosaurs. They came in handy the other night when we were invited to a neighbor's house for dinner. 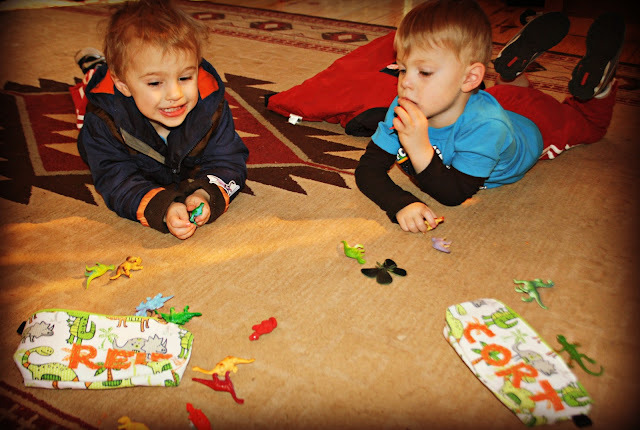 I love to watch them playing dinosaurs. Do you know what a dinosaur sounds like? Those little pouches you made are Precious, just precious. I think they probably did sound like Gollum. I am so glad we didn't skip this stage at my house too. Well, if I remember correctly from my days of cave living during the dinosaur ages, dinosaurs make a very loud roaring sound. It used to wake me up early every morning. I bet it's fun to listen to them. Cute pouches! I love how you put their names on them. Lol, Talking dinosaurs so much fun. I bet my grandson would like a dinosaur pouch. Thanks for the inspiration. Have a great day. lol, kids make everything fun, no doubt about it. Too funny. I enjoy reading about your boys' antics. I love those pouches! 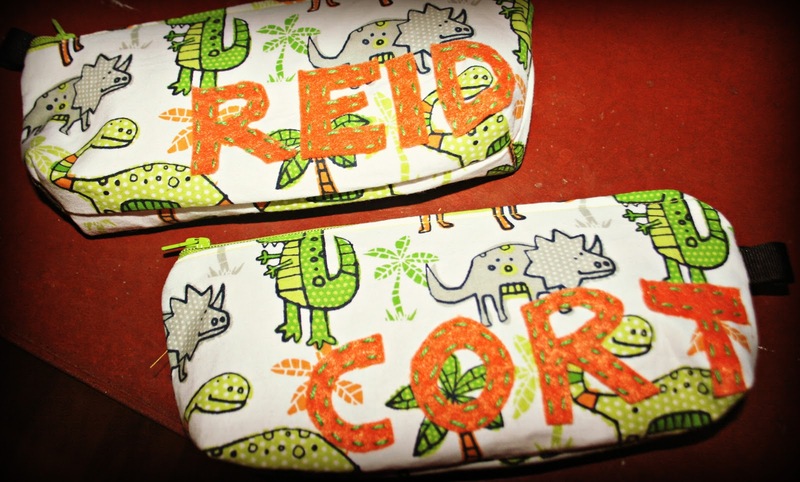 And the way you sewed Reid's and Cort's names on with the double contrast stitching is so cute!!! Those pouches are so cute! I love the pouches! So cute. Love that they are going through a dinosaur phase :) So sweet. Great pouch to carry the dinos in! The twins are growing so fast! Every Wednesday Morning I get to do a tiny tot story time - often we sing about dinosaurs - and - the children ALWAYS know how the dinosaurs should sound . . .
GREAT bags, Lisa! You do it all! The boys look so sweet and happy. Those pouches are so cute. My children never got into dinosaurs. I still have a collection of my son's dinosaurs stored away in the closet. *sigh* Such a sweet time. Do your boys like the book, "How Do Dinosaurs Say Goodnight?" I am SO hoping my little guy gets into dinosaurs. I am collecting some dinosaur stuff for Christmas...hopefully being slammed with oodles of dino stuff around the holidays will spark some excitement? Hopeful mama. Can't have enough pouches...those are fab! Dinasours talk in sign language. I'm glad the twins helped compensate for the lack of interest in the oldest! Such adorable pouches! And what a great way to keep them all corralled! I think we might have also skipped the dinosaur phase. Only time will tell. I love those little pouches. Haha! Seems like dinosaurs sound exactly like a little fuschia and turquoise lizard in Livie's toy box.